Fred Phelps, the founder of Westboro Baptist Church, died Wednesday, according to a spokesman. 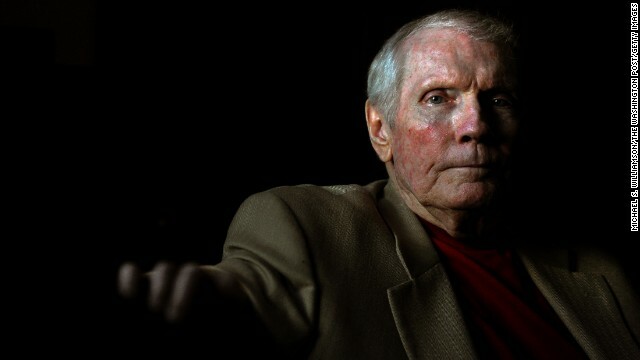 (CNN) - Fred Phelps - the founding pastor of a Kansas church known for its virulently anti-gay protests at public events, including military funerals - has died, the church said Thursday. The 84-year-old died of natural causes at 11:15 p.m. Wednesday, according to church spokesman Steve Drain. In a statement Thursday, the church chided the "world-wide media" for "gleefully anticipating the death." Next entry »Should we celebrate Fred Phelps' death? « Previous entryDoes the Big Bang breakthrough offer proof of God? He is a blip in the past. Forgotten already, which is where he deserves to be. Like an unpleasant smell that causes momentary discomfort, clears when you open the window, and is forgotten. He was a con artist who craved attention and he got it by going against God. Yes, he was the one who sinned. Ding-dong, the witch is dead; which old witch? The wicked witch! Ding-dong, the wicked witch is dead! goodbye and good riddance. All the good he may have done in the past was far out weighed by the hate he spread in the now. This planet is a much better place without him in it. He inadvertently did more for gay rights than anyone else I've met. Thanks, Fred, for giving us something to unite together over and rally against?? I wonder if anyone will organize a picket of his funeral the way he did to so many others? I'm with Ken, it's better not to make this a big deal. Hopefully the hate he spawned in his so-called church will disappear with him. "In a statement Thursday, the church chided the "world-wide media" for "gleefully anticipating the death." I know! Somewhere, Alanis Morrisette is singing, "Isn't it ironic..."
Personally, i'd rather his death go unremarked.